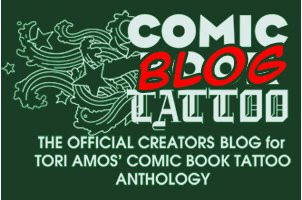 Today marks the beginning of Comic Blog Tattoo over on CBR where creators will be blogging about their involvement in the book, offering insights and sneak previews of their work. Hopefully, Leah and I will have a crack at it sometime in the future. Visit http://cbt.comicbookresources.com/ and check regularly for exclusive goodness.